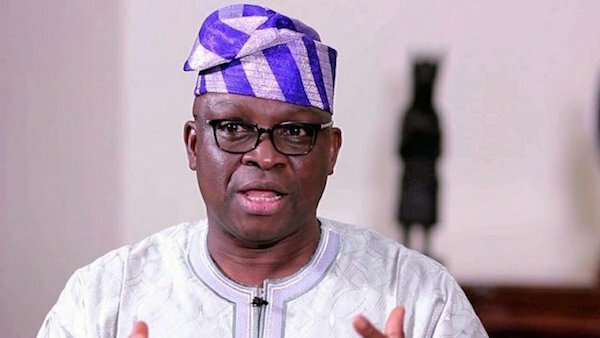 In a statement issued in Ado Ekiti on Friday, by his Special Assistant on Public Communications and New Media, Lere Olayinka, Governor Fayose, who said he was totally against hate speech and will support any effort to curb it, added that it was important to caution the federal government on the danger inherent in the blanket categorisation of hate speech as treasonable. The governor counselled that rather than blanket criminalising of hate speeches, the federal government should embark on reorientation of Nigerians, especially the youths on the consequences of hate speeches to the unity of the country and restore the confidence of the people in the government. The statement read; “I wish to express concern over the pronouncement of the Acting President, Prof Yemi Osinbajo that hate speech will henceforth be treated as terrorism. “While I am totally against hate speech and will support any effort to curb it, it is important to caution the federal government on the danger inherent in the blanket categorisation of hate speech as treasonable. “I make bold to say that saying the truth concerning the country and its rulers cannot be termed as hate speech. “I only hope Nigeria is not being systematically returned to the colonial days when the law of sedition was used to jail many of those who fought for our independence or the era of Buhari’s military regime when the notorious Public Officers (Protection against False accusation) Decree 4 of 1984 was used to jailTunde Thompson and NdukaIrabor, both of The Guardian newspapers for publishing what the government termed as false. “Most importantly, going by the APC government’s use of the so-called anti-corruption fight to harass, intimidate, arrest and detain opposition figures, there is no doubt that categorising whatever that is termed as hate speech as act of terrorism is unconstitutional and an attempt to gag Nigerians, especially the press. “It should therefore not be seen that since the use of corruption to harass, arrest and detain opposition figures is no longer fashionable, hate speech will now be another instrument of oppression to be used against opposition. “The questions that must be answered by the federal government are; what constitutes hate speech andwho determines it? Has the Presidency becomes law unto itself such that it is now the one to determine what is an offense and what punishment to be applied? “From all intent and purposes, the Acting President pronouncement which is obviously not backed by any legislation is an attempt to provide reasons for an impending clampdown on opposition and Nigerians will resist any attempt to mortgage their fundamental rights to freedom of expression under the guise of hate speeches. “When the APC was looking for power, several provocative statements were made. Nigerians are yet to forget President Buhari’s “the dog and the baboon would all be soaked in blood” hate speeches and the threat by the APC to form a parallel government. “What can be more treasonable than these statements made by President Buhari and his party? “It is also on record that during the 2011 election campaign, President Buhari’s inciting statement led to widespread violence by his supporters in the North after he lost. Over 1000 people were slaughtered in cold blood, including innocent National Youth Service Corp members. “Therefore, even if the APC government is sincere with its new found hatred for hate speeches, the APC government must first apologise to Nigerians for being the number one promoter and beneficiary of hate speech. Hate speech is freedom of speech in democratic societies of the Western World. Osibanjo thinks and behaves as a military dictator. Instead of introducing a bill to make freedom of speech as hate speech, why not use the same speed and effort to introduce a bill to restructure Nigeria.